Over the past couple of weeks, you’ve surely noticed that Forum Blue & Gold has been participating in season previews that were organized by the fine folks at Celtics Blog. Today, we offer our entry for the Lakers and answer five questions about the team going into next year. We’ll have other season previews in future weeks, so sit tight on those and enjoy this one today. The Lakers came into this past off-season as the two time defending champions but not without holes that needed to be filled. Last year, the team played with a patch work bench for most of the year where talented, but unreliable back ups at guard and injuries at small forward meant that the starters got pushed for longer and harder than preferred. So, the number one goal for this team was to improve its back up situation in the back court and find a reliable back up at small forward as a contingency to the oft injured Luke Walton and to ensure that Kobe does not have to be the primary back up to Ron Artest. With filling in those two holes in mind, the Lakers made out like bandits by acquiring both Steve Blake and Matt Barnes and did so by only using their mid-level exception. How Mitch Kupchak pulled this off is beyond me, but he effectively used the only real salary resource he had (the MLE) and signed two players that are both ideal role players for this particular Lakers team. In Blake the Lakers got a steady player in the mold of Derek Fisher that will knock down open jumpers, take care of the ball, organize the Lakers offense, and try on defense. And in Barnes the Lakers got a rugged defensive wing who has proven capable of knocking down the three point shot, is an excellent positional rebounder, and plays well off the ball. Neither player is a flashy, impact player but when incorporated into the structure of an all ready top-notch roster, these players should provide an excellent boost to a bench unit that will have the potential to extend leads rather than lose them or cut into deficits rather than have them get larger while the starters get their rest. 2. What are the team’s biggest strengths? Lets see…Size, length, coaching, confidence, experience, top end talent, depth…I think I can go on and on when it comes to the strengths of this Lakers group. But, I will say that the biggest strength that this team has is its ability to adapt to any style of play due to the combination of size, length, and versatility in the front court while also having Kobe Bryant on the wing. By having the ability to play Kobe in a line up that features both Gasol and Bynum, the Lakers can put size on the floor that few other teams can match. And because both Bynum and Gasol show the ability to control the paint on offense and defense, the Lakers have a nightly advantage where they make other teams take inefficient perimeter shots while getting high percentage shots of their own against the opposition. When you throw Lamar Odom into the mix, the dynamic then changes again where pace is increased, spacing improves, and both Kobe and Gasol (or Bynum) have more room to work on the floor on the offensive side of the ball. This makes double teaming more difficult and opens up lanes for slashing and offensive rebounding by players on the weak side. On defense, Odom also allows the Lakers to play more of switching defense without being hurt by as much by quicker guards penetrating or on the offensive glass because of Odom’s ability to stay with guards on the perimeter while still recovering to the paint to rebound with Gasol (or Bynum). So, again, the Lakers’ talented versatility allows them to adapt to any style of play while also having the ability to attack the weakness of any given team. There’s a reason that they’re the defending champions twice over. The Lakers biggest weakness continues to be its three point shooting. Last year, Derek Fisher regressed to a below average outside shooter and Kobe also had a down year in his attempts from distance. When you throw in the inconsistencies from Artest and the general up and down play of Sasha, you have a group of players that just can’t be relied upon to hit the outside jumper with any consistency. There’s always the hope that the addition of Blake – who is a career 40% shooter from three point territory – will help in this, but that’s not a guarantee. This lack of consistent shooting means that the Lakers can at times struggle to generate the proper spacing to give their post players room to operate on the low block and then fail to make opposing defenses pay by making shots when perimeter defenders help down in the post or shade to the middle of the floor to cut off passing and driving lanes. Last year, the Lakers were able to overcome this by making timely shots and/or getting hot at the right times but this lack of consistent shooting remains a concern coming into this season. The end goal of winning a championship is what this team will seek to accomplish by the time that June rolls around. However, throughout the season, other mini-goals will be set in order to keep this team on task. Last year, the Lakers coaches expressed disappointment in the fact that the team did not win 60 games, so I think hitting that benchmark will also be a goal this team tries to reach. I also think that the past two seasons this team has seen the significance of home court advantage in the Finals, so staying in the race for the best record in the league is also a goal that, if not outright stated, is something that this group will have its eye on. But even more simple than any of the goals that I’ve listed above, I think this team will really want to be playing its best basketball at the end of the season. Phil Jackson led teams have always wanted to peak at the right time and with this group I expect that the same mindset will be put in place. With the talent and experience that this team has, this group must know that if they continue to improve as the season progresses and play their best basketball in the playoffs that all other goals should take care of themselves. 5. Will this team show a greater sense of urgency during the regular season than last year? Predicting how this Lakers team will actually play on any given night is pretty close to a fool’s errand. Last season, many would have thought that the drive to repeat and the want to earn home court would have been enough to push this team to play its best basketball every night. However, injuries, contract situations, and general complacency conspired to keep the Lakers’ win total lower than many expected. That being said, I do think this team will take the regular season a bit more seriously. First and foremost, I think this team will play with a bit of a chip on its shoulder and display a hunger that was somewhat absent during last year’s regular season. Many pundits (and Vegas, too) are already labeling the newly formed Heat as the team to beat for this years championship and considering the prideful players that are on the Lakers roster, that can’t sit well with the defending champs. And when you add the newly acquired Blake and Barnes, the infusion of new blood will also help bring that nightly hunger that was sometimes lacking last year. Second, there’s a real possibility that this upcoming campaign will be Phil Jackson’s last on the bench. Sending Phil out on a high note could also serve as a motivating factor for the team and drive them to achieve at higher levels during the regular season than they’ve shown in past years. Mind you, none of this is a guarantee but with these factors in play, I do think the Lakers will show more consistency in the regular season. The Lakers will be fine. I predict another championship. I think all the players will actually be hungrier. It seems to me that our vastly improved bench should prevent five or six of those fourth quarter collapses that dogged our team last year, and Kobe should still be good for at least a couple of wins through last second heroics. That would put them in the 65 plus range in wins this season, with other motivating or restraining factors such as HCA, optimal rest at the end of the season for Kobe, Pau, etc. determining where exactly they end up. Phil is not the kind of coach to burn out his best players trying to reach a meaningless goal (such as best overall record) at the expense of optimal readiness for the playoff run. And don’t tell me there’s a difference because there’s not. not happy to hear that Bynum isn’t ready for training camp. Would like him to play a full year, camp included. It’s not the end of the world, but it puts more minutes on everyone else. Can’t wait for this season to start. This has got to be one of the most anticipated seasons for me. The last 3peat was great, but this just seems better…maybe it’s due to the whole Miami Thrice or PJ’s last season. Add all that in and the chance to 3peat and Kobe getting that 6th ring along with MJ, just can’t wait!! Agree with everything said, I do however think we’ll end up with at least 65+ wins due to the fact we have a more consistent bench, plus we learned last year in the Finals that HCA is an absolute must so I can see this team pressing hard for the best record. I think our team enjoys more success this year chiefly because we have playmakers inside and out, supported by players who don’t need touches to contribute. This kind of relates to what Darius wrote about the Lakers’ greatest strength. I think the Lakers’ greatest strength is balance and continuity. And continuity does not come at the cost of duplication. Shannon and Matt are solid defensive back-ups. The former’s athleticism is unique, while the latter’s off-the-ball play and smarts give the offense another dimension to explore. I feel Steve is not yet a clutch performer, capable of drawing momentum-swinging charges and hammering nails in an opponent’s coffin like Derek. But he’s a more efficient ballhandler and 3pt scorer. I’ve also warmed to our new back-up point guard’s defense, as Portland’s defensive schemes and execution have been atrocious. I don’t think he’s great, but he’s just not bad. Our big man rotation can adapt to any situation. We never have to sacrifice speed or skill for length because of Lamar. And I’m trying not to get my hopes up, but I feel D.C. will match-up well against nuisances like Paul Millsap and Craig Smith, and positively menace stretch 4s like Channing Frye. Fun stuff, feel much more at ease going into this season than last, where we added Ron in place of Ariza. I envied the Cav’s ‘rout early rest early’ regular season last year; let’s hope we get something like that going for us this year. With training camp right around the corner, I definitely got that itch that needs to be scratched. It’s the most …. Wonderful time …. Of the year. And believe you me, I ain’t talking about Christmas. It’s NBA Time. I believe this Season is one of the most Anticipated ever (especially for us Lakers Fans) for so many different reasons. 1. The Miami Beach Boyz. 3. The Possibility of a Lock Out Come July 1st. 4. Kobe Tryin’ To Equal Mike. 6. The Opportunity To Tie Boston for Most ‘Chips in NBA History. 7. Phil Attempting to 3peat for the Fourth Time. 8. Kobe Attempting to 3peat for the 2nd Time. You get the Point. The list just goes on & on. So many Motivating Factors for this Season. In my Opinion, health will be the main concern for this team. That’s why I feel that it was imperative for Kobe & Pau to take the Summer off. This, along with a much improved bench, will allow for Fresher legs come Playoff time. Interested to see how Drew looks once the season begins. In order for us to 3peat, we’ll need for him to be as close to 100% as possible. As I feel we won’t get the breaks that we received during last years title run (A youthful & athletic, yet Inexperienced Thunder team in round 1; A depleted Jazz team that couldn’t match up with us in rd 2; A perimeter oriented Suns squad that had so much problems matching up, that they had to resort to a Zone Defense in the Western Finals and the Injury to Perkins in game 6 of the Finals, which shelved him for gm 7). Now I mention this Not to say that we couldn’t have Won the Chip without these breaks, because I definitely believe that we would’ve (and for the record, we were nursing some injuries also), but I’m an individual that Calls it As It Is & Not how I Wish to See It & the Bottom Line is that we caught a few breaks during last years Journey. This season, with the Mavs adding Chandler to go along with Dirk & Haywood; Yao returning to health? to go along with Scola, Brad Miller & possibly Erick Dampier out in Houston; Portland regaining Oden? & Pryzbilla? to go along with L.A. & Camby; The C’s snatching up the O’neal Firm to go along with KG, Shrek & Perkins? once he returns and with The Beach Boyz now on the scene, it’s going to be a War of Attrition that will once again be Won in the paint. So Bynum, more so than in previous seasons, will be relied upon to Maintain his health in order for us to ‘Retain The Belts’. Haven’t been on the site in awhile – but I think it is naive to think the Lakers will win more than 60-61ish games. Or at least think that is one of their goals. Watching the Lakers over the past decade and a half has told me one thing – to lower regular season expectations, expect some “Turrible” outings, some random miracle shots, and overall relative mediocrity compared to their capabilities. This is the same exact team many writers as ESPN wrote off in April (along with Boston), mainly because they looked and played terrible. And those writers, at the time, were right. They were certainly not playing well by any stretch of the imagination. Blake and Barnes are going to be good additions, dont get me wrong, but every team in the league is still going to play a basic zone against us because we have no shooters – and by that I mean guys that were just born to bust zone defenses with their shot. Outside of Kobe, who doesn’t take a ton of open threes so the stats are a bit scewed, we dont have really any consistent deep threat. Blake has been a good shooter before, and should be in the 40% range from three, but Barnes was getting wide open threes all season in Orlando and shot 32%. To put that in perspective, everyone thought Fisher was shooting horribly from 3 last season, and he was 35%, on 40 more attempts. Then we have Artest – very streaky, Brown – 18ft or less, and Vujacic – will sit on the pine all season. So that will be an issue to deal with regardless. Some of the matchups this season will be exciting – Houston, Miami, Boston, OKC, Portland – but expect the Lakers to be more or less hum ho outside of those games. Thats the way Phil runs the regular season, and thats what we should come to expect. Liking this Laker team is easy, but predicting the number of games the Laker team might win this season is hopelessly premature and unwise. I only hope that they will win enough games to make the playoffs. Everything else is gravy. With this new roster, I expect further expansions of Laker thinking from last season. Neither Barnes nor Artest were brought to the Lakers for their three point shot percentages, but rather to limit the overall shooting effectiveness of the opponents that they will face. I believe that the entire Laker team is ready to embrace such a defensive mission. Rather than bring Laker 3 point shooting up, the three point shooting of players like Durant and Pierce will be kept down. This expanded defensive focus may not emerge right out of the gate, but it should be clear by mid season. Lakers now have a serviceable veteran shot blocker to back up Andrew, and a perfect complementary player to back up Derek. Shannon may strengthen his defensive play with a heightened defensive focus, and Luke/Sasha might make significant defensive contributions as well. Two first year draft picks may add some enthusiasm and youthful intensity to a team still dominated by established veterans. It’s not percentages of three; it’s the Laker’s D–get used to it. I think the real question is, what are the most likely areas for improvements in the upcoming season. I think it is much more likely that the offense will improve more than the defense. And a significant part of that offensive improvement will be improved three-point shooting. 12, and Ron Artest sucking less (on offense). Hopefully. I do not believe that the Lakers will approve appreciably on three point shooting, but I do believe that the defense can and will improve. Blake should make better decisions than Farmer, but not significantly more three pointers. Where will the improvement in three point shooting come from? @#15 drrayeye, last 3 years 3pt% Farmar was 37, 33 and 37. Blake was 40, 42 and 39. Blake averaged one more attempt a game than Farmar. I don’t think it’s unreasonable to think that Blake will make significantly more 3’s especially if he’s also going to get more playing time than Farmar. 15) Blake is better than Farmar, and I expect that Brown, Bryant, Fisher, and Artest will all shoot a little better than they did last year. We seem to continually make the mistake of talking about how the offense is going to do. What drrayeye was saying is that it is the defense that should improve. The offense may or may not, but that is not the critical factor. Why are we continually discussing the points and pretty much ignoring how we prevent others from scoring? The Cs didn’t win because they were an offensive juggernaut. The discussion was what is more likely to improve/where it would be easiest to make improvements. Using last season as the baseline, it seems pretty clear that the offense is where there will be the most “bang for the buck,” as far as when it comes to allocating practice and coaching emphasis. We are NOT saying that defense isn’t important, or can’t be improved upon. I agree with you, but only to a point. I too think the Lakers can improve on defense. We do need to remember that while the Lakers were a top 5 defensive team for most of the year, they stumbled in the second half of the season to the point that they did fall several spots in defensive efficiency rankings. So, I think there’s merit in saying that the Lakers can improve on D.
However, the Lakers did underperform last season on offense. Ranking 10th or 11th all season in offensive efficiency is too low for a team as talented as the Lakers and there is major room for improvement on that side of the ball. 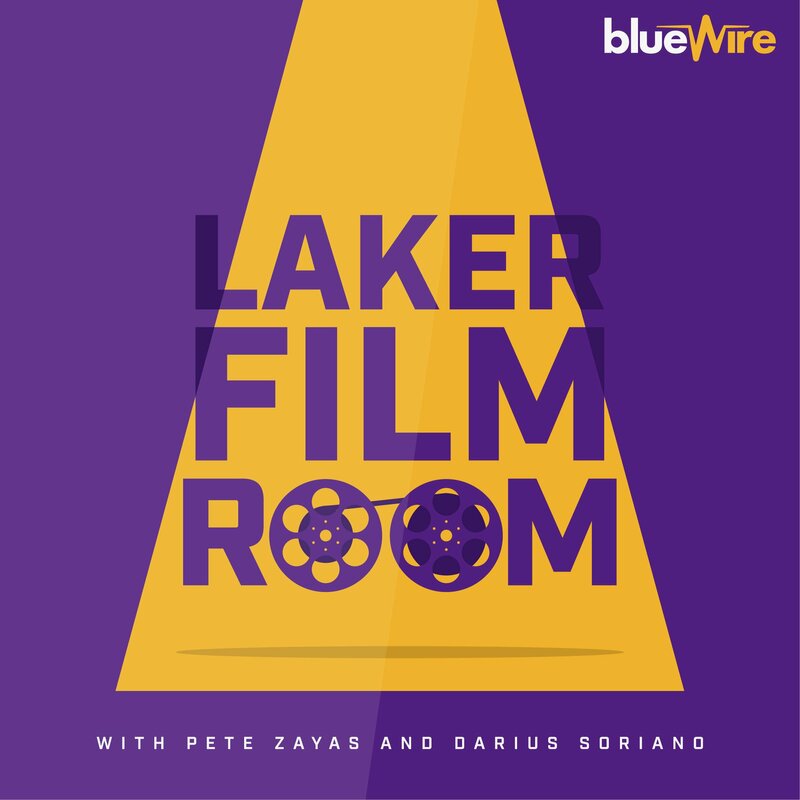 The Lakers should be a top 5 team – efficiency wise – on both sides of the ball as their talent base is set up to establish that. Remember too that the Lakers defensive principles actually begin with execution on offense. We discussed this before in a past post, but by executing the Triangle well the Lakers generate the type of spacing and floor balance that leads to the easier transition from offense to defense. This easier transition means that opposing offenses then face a set Lakers D more frequently even when the Lakers haven’t scored a bucket (and the opposition is forced to inbound the ball). Essentially, I think that if the Lakers perform better on offense – while still keeping up their same level of defensive intensity – that they’ll actually improve on defense just because of the fact that the opposition will then have to play against a set Lakers D more often. That means less fast breaks for the opponent, more crowded driving lanes, and ultimately working against shorter shot clocks. @15… I think the Lakers will see a significant improvement in 3pt shooting this season relative to last season. Here were last season’s main three point shooters along with the number of attempts taken: Bryant (301), Artest (296), Farmar (229), Fisher (224), Brown (189), Odom (182), Vujacic (81). These seven players took over 96% of the team’s three-point attempts. Now we will look at how each of these players shot the three last season relative to the two prior years. Bryant obviously had a down year with his three point shot (probably due to the finger and the heavy taping of it). I expect Kobe to have a bounce back year and shoot closer to the two prior seasons (certainly no worse). Artest also had a poor year shooting the three-ball. He actually shot very well (around 38%) through the first 4 months of the season and then had a horrible March (26.8%) and April (25.9%) which corresponded to when his injuries started to affect him. I expect Artest to also have a better season shooting than he did last season. Farmar had a good season last year and lead the team in 3P%. He is no longer with the Lakers but Steve Blake has taken his role so lets take a look at Blake’s shooting percentages the last 3 seasons. Blake is obviously a solid three point shooter. What most people don’t know is he is ranked 44th in NBA history for career 3P% at 39.3% just behind Reggie Miller (39.5%) and Ray Allen (39.6%). The Lakers should improve from behind the arc just by having Blake take the shots that Farmar took last year. Fisher, like Bryant and Artest, had a poor season shooting the three. I don’t know why he had such a drop off as 3P% isn’t something that typically suffers with age. I fully expect him to have a bounce back season. This was Brown’s first season of meaningful minutes so it is tough to gauge his true shooting ability. That being said, he did hit 30 of 92 attempts (32.6%) in his career prior to last season so last season was right on par. We could see an improvement though as most young guards to improve their 3P% with time and practice. Odom had an average shooting season. He has consistently been a 31-32% 3PT shooter his whole career. I don’t expect any change in Odom’s efficiency from behind the arc next season. He is what he is. Vujacic had an awful season shooting the ball. Most Lakers fans have given up on him but he is a career 37.1% three-point shooter and likely won’t shoot any worse than he did last season (it was that bad). So what does this mean? Let’s assume that Bryant, Artest, and Fisher each shoot their average from the prior two seasons, Blake takes over Farmar’s threes, Sasha hits his career average, and Odom and Brown hit the same as last season (right on their career average). These all seem like very reasonable assumptions… so what is the impact? Last season the Lakers hit 34.1% of their three-point attempts (24th in league)… but under this reasonable scenario the team’s three point shooting would be 36.8% which would have placed them all the way up to 7th in the league!! This is why I think the Lakers will definitely improve in three point shooting. I think they really helped their three-point shooting with the addition of Blake.